Time For Remembrance Featured on BBC Spotlight Devon 2015. 6th January 2017. Spotlight BBC piece relating to a call out to the South West of England to contribute to our new book. Presenter David Lowe congratulates timeforremembrance.com for its 'innovation'! David Lowe has been presenting and producing music-based radio programmes for the British Broadcasting Corporation (BBC) for more than thirty years. He is also a published author. "Maisie Pops" (see link below) is a ghosted autobiography of a rather rebellious, single-minded lady whose life choices between 1913 and 1965 pre-dated the "girl-power" phenomenon by half a century! David now has a follow up book, see the link below for details. David has been one of the greatest supporters and advocates of this archive since its inception last September 2013. Please click on the link above to hear the evocative music David chose to represent our War 'Time' archive, in the October 2013 blog, under the 'Remember Our Heroes' feature. David has now returned to Radio. Find him at; http://bcfmradio.com/dialect​ where he delivers his unique style and plays many great, popular songs. regarding his unique career as an author. Stop all the clocks! It's Time to Remember the First World War! from The Western Morning News Published December 16 2013. The grand-daughter of a Japanese POW has come up with a unique way of commemorating the centenary of the start of the First World War - using time itself. 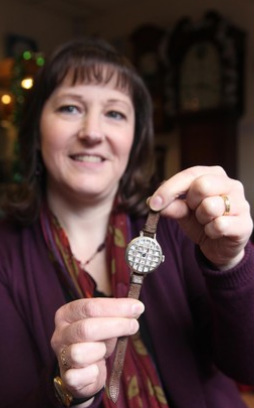 Cathy McAnespie, Britain's first woman clock and watch repairer, has created an online archive called Time For Remembrance about timepieces of war. Cathy, known as the 'clock doctor', runs the PrimeTime shop in Exeter, Devon. She said: "The objective is to archive as many images of timepieces belonging to all those associated with all conflicts locally, nationally and internationally. "The timepiece may have been worn by a great-grandfather in the trenches in World War One, saved the life of Tommy at the Somme been captured at Dunkirk, or be an image of the local church that survived the Blitz. "We are inviting visitors to the site to post their pictures and grow the archive in order to compile the greatest compilation of timepieces associated with conflict ever archived. "This is a unique concept, and driven not only by my love of horology but also in an awareness that fewer people seem inclined to 'remember' our heroes than used to be the case." One particular item featured on the site is close to her heart - her grandfather's trench watch fitted with a shrapnel guard he wore during the Second World War. He was a Japanese PoW from 1940 to 1945 and took part in the infamous building of the bridge over the River Kwai. Other items in the archive include a watch that stopped a bullet during the First World War and one from Hiroshima, Japan which stopped at the exact moment the first atomic bomb exploded over the city. From the 'Express & Echo' Newspaper, October 03, 2013. EXETER horologist Cathy McAnespie has come up with a timely idea to mark the centenary of the start of the First World War. "The objective is to archive as many images of timepieces belonging to all those associated with all conflicts locally, nationally and internationally. "The timepiece may have been worn by a great-grandfather in the trenches in WW1, saved the life of Tommy at the Somme been captured at Dunkirk, or be an image of the local church that survived the Blitz. 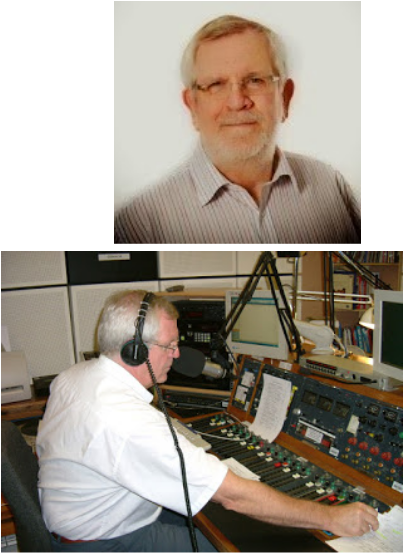 Cathy seen here in the left image, with presenter Colin Slade during his show on Radio Exe. Cathy was raising the profile of horology and women in business on the show. Cathy had her own radio slot on BBC Radio Devon for several years, answering listeners' queries relating to their timepieces. Above right; seen with Matt Woodley, interviewing Michael Aspel inbetween the filming of Antiques Roadshow, for her radio slot. See www.primetimeexeter.co.uk for the full interview. Excerpt from 'The Antiquexplorer' telling Cathy's time with the Antiques Roadshow team for her radio slot.